Pixel-Consulting:build oscarpina$ sudo /usr/local/zend/bin/zendctl.sh restart Password: Stopping Deployment [OK] Starting Deployment [OK] [19.04.2013 20:10:58 SYSTEM] watchdog for zdd is running. [19.04.2013 20:10:58 SYSTEM] zdd is running. Stopping Zend Server Monitor node [OK] Starting Zend Server Monitor node [OK] [19.04.2013 20:11:05 SYSTEM] watchdog for monitor is running. [19.04.2013 20:11:05 SYSTEM] monitor is running. /usr/local/zend/bin/apachectl stop [OK] /usr/local/zend/bin/apachectl start [OK] Stopping Zend Server GUI [Lighttpd] [OK] spawn-fcgi: child spawned successfully: PID: 14481 Starting Zend Server GUI [Lighttpd] [OK] Stopping Java bridge [OK] Starting Java bridge [OK] Stopping JobQueue [OK] Starting JobQueue [OK] [19.04.2013 20:11:19 SYSTEM] watchdog for jqd is running. [19.04.2013 20:11:19 SYSTEM] jqd is running. MAMP server works ok, but I don't have phalcon extension active. I've built phalcon as 64 bits. 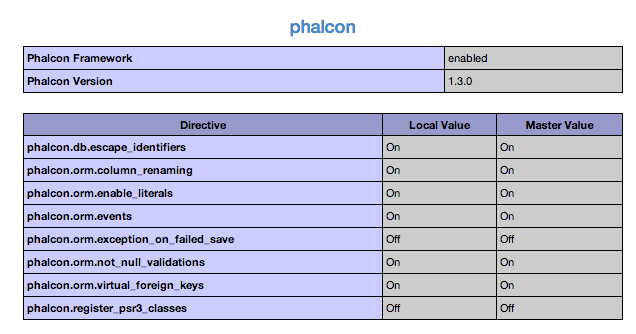 I don't understand why phalcon extension is not in phpinfo in Configure command? Macports (http://www.macports.org/) is usually an easy way to install php/apache/mysql packages without this complexity. MAMP has a php version 5.2,5.3 and 5.4 and is very easy to install / uninstall php/apache/mysql. You can change of php version only with one click. The difficult for me is add this php extension. Also MAMP Server components and libraries don't provide the source code for PHP 5.4.x, making even more difficult get the necessary libraries to perform the compilation. I've tested it using MAMP 2 loading/working without problem. Are you getting any messages in the logs? Ok. Thanks Phalcon for your help! 1- I have deleted MAMP and MAMP PRO folders 2- I've installed MAMP 3- I've done the steps that @phalcon said me: copy the file to: /Applications/MAMP/bin/php/php5.4.10/lib/php/extensions/no-debug-non-zts-20100525/ and add extension=phalcon.so to /Applications/MAMP/bin/php/php5.4.10/conf/php.ini 4- I've started MAMP server (not MAMP PRO). Thanks a lot for all support!! @Phalcon Can you compile the Phalcon.so(1.2.0) and Phalcon.so (1.2.1) on M lion(10.8), Because i did not success to compile the Phalcon for 7 days, Thank you very much. Raxan your link is just WORKFULL !!!! thx a lot i was desesperate with the install but you save my life xD.